A source in the Electoral Commission, the failure to win three candidates after the end of the process of manual counting and sorting of the partial results of the ballot boxes contested. 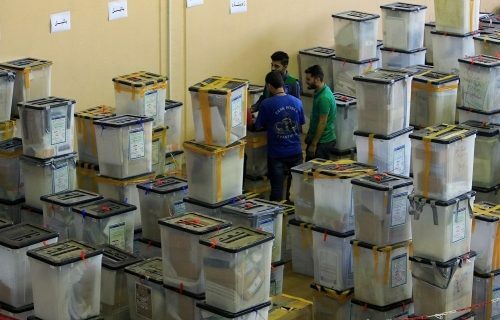 The source said that "the leader of the National Coalition Speaker of the House of Representatives Salim Jubouri, the leader of the Iraqi decision coalition Salman Jumaili, and the head of the list of solution Mohammed Karbouli, and candidate Ali Alsjeri did not win the results of the parliamentary elections after the counting process. He added that "Al-Fath Alliance won a new seat after the counting and the winning candidate Mohammed Al-Daraji." He pointed out that "is scheduled to issue a statement on Thursday evening on the Electoral Commission administered by the Council of Judges assigned with the results of counting and sorting and will be posted on the website of the Commission." Posted in Commission, Dinar Speculator, Iraqi Political News.